Wright State University faculty and staff members shared experiences and learned from each other during the Wright Womxn’s Leadership Network inaugural speaker event. “Developing Women Leaders in Higher Ed” was the focus of the Wright Womxn’s Leadership Network’s inaugural speaker event on Sept. 25 with Donna Chrobot-Mason, a nationally recognized scholar in leadership across differences. “One of our goals with these events is to create opportunities for people to meet new people in order to strengthen and deepen their own relationships and professional networks here on campus,” said Stephanie Goodwin, director of faculty development and leadership at Wright State University. The Wright Womxn’s Leadership Network was formally launched in April when more than 70 womxn leaders and aspiring leaders responded to a call to convene a group to share their hopes and aspirations. More than 150 faculty and staff members have joined the group, which offers programming based on the wants and needs of those in the network, as well as professional development opportunities. Chrobot-Mason presented a high-level overview of research she and a team of scholars have conducted regarding arguments presented by Sheryl Sandberg in her popular book, “Lean In.” Chrobot-Mason and her colleagues set out to understand whether the literature and evidence support several of Sandberg’s main arguments. The study will be published in the Academy of Management Perspectives in the next few months. 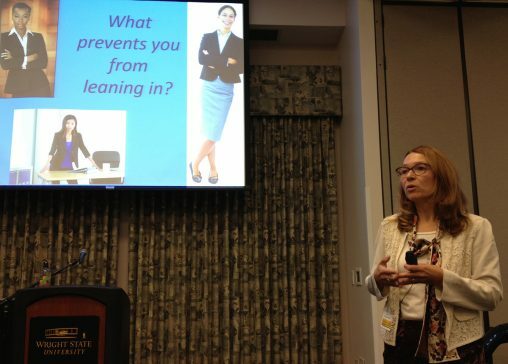 Donna Chrobot-Mason, the inaugural speaker for the Wright Womxn’s Leadership Network, shared upcoming research related to “Lean In,” by Sheryl Sandberg. During the interactive presentation, Chrobot-Mason led a discussion about what prevents women from leaning in. Then in small groups, participants shared a time when they leaned in and it paid off, as well as how they have overcome barriers. Chrobot-Mason is the director of UC Women Lead and an associate professor and director of the Center for Organizational Leadership at the University of Cincinnati. She also shared how she has leveraged some of what she learned through her research into UC Women Lead. “Womxn” is an inclusive spelling of the word “women” that recognizes the intersectional identities of all women, including trans women and women of color. Goodwin noted that future speakers for the Womxn’s Leadership Network will be announced later this winter/spring. Individuals interested in receiving advanced announcements about WxLN events and priority registration are encouraged to email fdl@wright.edu to receive more information about joining the network.